Our proprietary radio technology has evolved to meet the demands of the toughest RF and physical environments. With superior noise rejection, sensitivity, and extended temperature range, the Spectra 910 excels where many other transceivers fail. The feature-rich Spectra-910 allows easy interface to new and old field equipment. A pair of Spectra-910s provides a practical and reliable alternative to using traditional analog phone-line modems or "null-modem" serial cable (RS-232) connections for data communications between serial communications equipment. 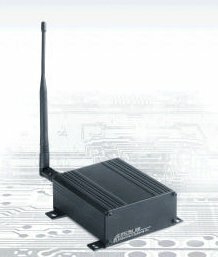 Moreover, wireless data communications using the Spectra-910 means you will benefit from: greater flexibility and freedom to relocate serial communications equipment; reduced cabling hassles; eliminated requirement for access to wire-based transfer media such as telephone lines; no ongoing access fees; and, the ability to communicate through walls, floors and many other obstacles. The Spectra-910 is the most recent addition to Microhard Systems' family of RF modems. Our attention to customer feedback has resulted in the most comprehensive set of features for SCADA and telemetry applications. Users now have the ability to deploy virtually any topology of network, including unlimited repeater capability, RTS/CTS framing, Modbus compatibility and many other data formats. No limit on the number of repeaters you can cascade. 3. Repeater also function as Slaves. There is no limit on the how many repeater you can deploy. 5. Optional -40 to +85°C available.